I’m not a big fan of these generation labels, but technically, I’m Generation X. I don’t recall all the stereotypes, but most of them probably apply to me. Still, for all those defining characteristics, my generation wasn’t all that different from my parent’s. The Baby Boomers. Most importantly, the space between our generations was narrow enough that they could rely on their own life experience to guide their parenting. Unfortunately, that’s not the case for me and my iGen teenager, who, along with his entire generation seems like a fading silhouette on the other side of an expanding abyss. Even typing that, I can’t help but feel like I have become the curmudgeon my teenage self once believed most adults to be. Then I think of how different even the little things have become and my provincialism feels a bit more justified. Music, which in its own way has defined generations, might be the simplest example of this unprecedented generation gap. In 1957, if my parents wanted to hear their favorite song, they had to buy the record or hope it came on the radio. In 1987, I could sit next to my radio with my fingers on the tape deck’s play and record buttons ready to pounce when Mr. Mister’s “Kyrie” came on -Don’t act like you don’t love that song. In 2017, my son can literally hear any song he ever wants at any time through a device he carries in his pocket. Of course, with that same device, he can buy anything he ever wanted, see things I could never have imagined and endlessly scroll through a constantly updating cascade of puppies, gamer play-throughs, Youtube videos, fake news, and memes. All the while he is never more than 2 clicks away from some of the most graphic and disturbing images the darkest parts of the world can dream up. Technology seems to have given our kids a backstage pass to a place where the rules haven’t been written yet. Making matters worse, the break-neck pace of innovation guarantees that as soon as we start to figure things out, technology will hit the reset button. It is no surprise that many parents are left scratching their heads. One morning, as my son pressed down the lever on the toaster with his left hand while thumbing the screen of the cell phone he held in his right, I had this very distinct feeling of foreboding. This is the new definition of multi-tasking. It has become so commonplace that most of us don’t even notice it anymore. I think that’s why it never really jumped out at me until now because it certainly wasn’t the first time I had seen it. This time, I just happened to be in the right mindset to question what I saw. So, what’s wrong with what he did? To some parents, maybe nothing at all. In isolation, it is even comical -partly because it is such “adult” behavior. Like a toddler wearing his father’s dress shoes. The question is, what is the cumulative effect? Like any habit, each successive experience builds precedent for future recurrence and the media he consumes rewards his attention. It is a vicious cycle that combines with other similar incidents repeated multiple times a day. Every day. It all must add up. Exactly what it adds up to may be subject to debate. We don’t have a lot of large-scale studies on how cell phone use impacts social skills. Most seem to involve relatively small test groups. Besides, cell phone features and new apps come and go so quickly that the few studies that do exist cannot evaluate long-term implications. If the data does come, it will likely be too late for parents to do anything with it. I generally trust my parenting instincts, even though I’m new to this particular theme. I also trust my child, but he can’t see what I can see. As different as my life has been from his, I’ve had a chance to learn the life-affirming value of human relationships. We learn by doing. Patience is learned by being patient. Decision making is learned by making decisions. 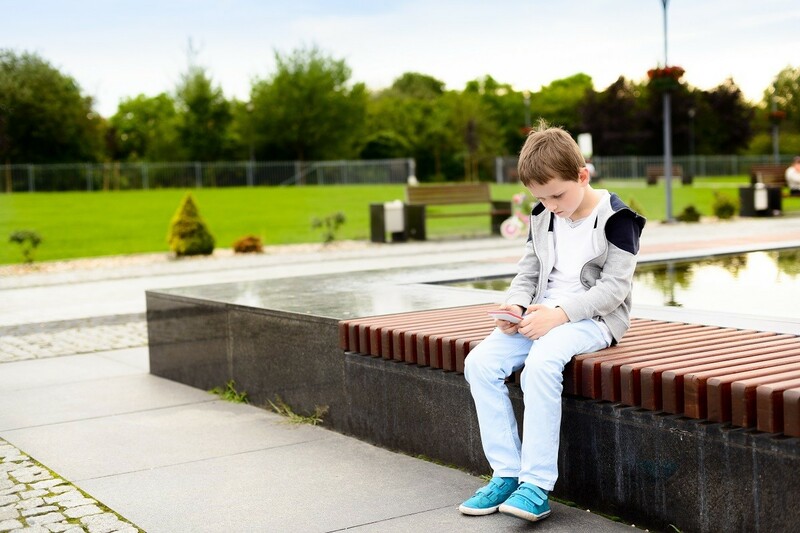 Whatever other skills and lessons may be learned, each moment of passive, one-sided, cell phone use happens to the exclusion of social connections. When it comes to my children, the prospect of a disconnected life scares me more than anything they might happen upon on the internet. There is plenty of data to support my concern. In fact, a 1988 study by House, Landis, and Umberson put it very bluntly “individuals with the lowest level of involvement in social relationships are more likely to die than those with greater involvement .” Another study of more than 6,000 people in California found that the risk of death among men and women with the fewest social ties was more than twice as high as the risk for adults with the most social ties. OK. So, ignoring other humans isn’t a death sentence, but for brevity’s sake, I didn’t even get into the effects of lower social connections on physical, mental and emotional health. Let’s just agree that there is a ton of grey area between deeply engaging in a community and total isolation. Studies show conclusively, that the less you connect with other humans, the darker that grey gets. Up to now, I have comforted myself with the knowledge that so many other kids his age are far more entrenched in social media and more heavily addicted to their cell phones and video games. His association with them, of course, normalizes the behavior even more. But he’s also a fantastic kid; kind, polite, funny and intelligent. He’s a wonderful son. However, I now understand that this type of rationalization is how we got here in the first place. Once I stepped outside that bubble, I was able to see things differently and re-define my position. My wife and I decided to sit down with our son to talk about his cell phone use. It is just one part of a complex relationship with media, but we figured we had to start somewhere. We spit-balled a little beforehand trying to concoct a message that would not only be brief and simple to explain but would also stand up to teenage cross-examination. We settled on a few takeaway points, but in the actual talk, I’m pretty sure only one of them really stuck; We are uncomfortable. We explained that with nothing to go on, we are winging it, which essentially amounts to the blind leading the blind. That is an uncomfortable situation for any parent and, I might add, not an easy thing to admit to your teenage son. So in this iGen/Gen X partnership, the minimum standard must be that we are able to parent from a place of comfort. We all share the responsibility to work toward this point. How does a teenager respond to the idea that his parents not only don’t know what to do but aren’t comfortable enough to resolve the situation? The teenage brain is a fickle thing, so it was a risk. We figured he would initially value our honesty and our desire for partnership but our stated ignorance and discomfort would always be there to use to his advantage. His immediate response was so much better than we had hoped. Not only did he understand our side of the conversation, but he seemed to genuinely want to help us become more comfortable. Time will tell if we can continue to share that goal. Maybe this doesn’t work with another child. Maybe it does. Clearly, there are all sorts of variables and relationship differences, which would influence that. Furthermore, I’ve just started down this road, so I don’t know how this goes in the long-term. I can tell you it feels better than doing nothing. Sometimes in the marathon of parenting, that’s enough. Above all, I think parents should know that it’s o.k. to feel a little lost in your child’s world. Perhaps no other generation of parents has ever had more cause to feel this way. You are not alone. It is not a personal flaw or a weakness. To me, knowing you don’t have the answers is evidence of thoughtful parenting. However, whether you choose to talk to your child about what you’ve seen and how you feel, is a decision that will be made for you sooner than you think.